The Good the Bad and the Insulting: Is Batman & Robin Really Such A Bad Film? The last five years or so have been tumultuous for the cinema industry, to say the least. We've had plenty of hits, plenty of misses, a few great classics emerge while failures derided by the public somehow endure, and nostalgia is mined for profit. Oh dear lord in heaven, is nostalgia mined for profit. Even ignoring the likes of Birdemic and The Room, Fant4Stic, a seemingly unstoppable tide of Chipmunks films and unwanted remakes seems to keep causing people to question who keeps watching these films. Personally though, it makes me question if things are really so bad. After all, the 1990s were something of a dark age for many franchises and retained the same problems. Oh, there were plenty of hits to be sure, but you had that same mishandling and nostalgia mining. Perhaps the quintessential example of this is a film whose name will sadly hang over its director until his death: Batman & Robin. Despite Joel Schumacher desiring to make a darker film more in line with the Tim Burton films - based on Batman: Year One no less - Warner Bros. nevertheless mandated changes at every turn. Between execs demanding repeated changes and a more kid friendly direction, more than a few questionable decisions on Schumacher's part and an infamous script, it's one of three films blamed for the brief death of the superhero genre. Well, in films anyway, it was still doing fine in the animation department. Bombing so hard that it would be eight years before anyone could consider a Batman film again, it's hardly undeserving of this reputation, yet the most surprising film is that it's not without some redeeming qualities. Hell, by comparison to some of today's disasters or even successes (yes, Michael Bay, that was directed at you) it's positively tame. What's more it could even be argued that the film actually corrects many mistakes of its predecessors. Let's take one aspect into account above all others first of all - Alfred. Now, say what you want about the prior three films, but just consider this: What impact did Alfred actually have on them? While he certainly offered moments of moral support and action here and there, for the most part Alfred seemed to be relatively superfluous. Unlike Batman Begins, there was little direct role in setting up the batcave or even technical support for him to offer; with perhaps his only prominent moment of action appearing in Batman Returns, when Alfred assists in the sabotage of the Penguin's political rally. It's a true testament to Michael Gough's skill as an actor that Alfred remained as memorable as he did, despite being bereft of any major role within the script. So, after three films of him largely remaining in the background, Schumacher opted to make use of him. For starters, Alfred here has his own personal sub-plot, with his impending death thanks to the advanced stages of illness. This is tied heavily into the core plot with Mr. Freeze, giving him a distinct link with the main villain, but it also provides him more of a connection with the heroes. The Alfred we see here is given more moments to really communicate with the heroes, especially the new Batgirl, to offer advice and really depict his role as a mentor. When Bruce asks him for advice, really asks him in a moment of uncertainty, it makes his presence within the group far clearer than anything prior in the film franchise. That and, in all honesty, it helps to carry some real emotional weight for a film which is trying take hit a new world record for zaniness. Atop of this, we also find out far more about his personal history and ties to the rest of his family, giving him more substance than before. In all honesty, daft as it might sound given the film's reputation, he's far more of a character here than a cartoonist stereotype of a butler. What's even more surprising is that Alfred himself isn't the only figure here to actually benefit from some surprisingly poignant writing. The other is actually Mr. Freeze himself, who proves to be one of the series' best written villains up to that point. No, this isn't a joke, please just hear me out. Think of everyone seen up to this point as a supervillain and what history they really offered. The Joker had some history with the Wayne family but that was reflected more by Batman himself than really building a relationship. While certainly thoroughly entertaining and classically mad in a way only Jack Nicholson could pull off, he served as more of an obstacle than arch-nemesis. The same was sadly repeated again with the Penguin during Batman Returns, the script often seemed confused when it came to presenting his role. While often showing scenes or moments which seemed to warrant sympathy, the rest of the time he appeared as a grotesque, gluttonous savage without morals. Like before, the best thing about him seemed to be Danny DeVito himself, and some of the ideas Tim Burton was working with rather than their execution. After all, it's hard to feel truly sympathetic about a villain gleefully using a severed hand to prove a point, biting off the nose of an innocent man and even planning mass child murder. As for Batman Forever, well, Jim Carrey was being Jim Carrey and Two-Face was little more than armed muscle by the end. There was sadly little sympathy or depth to be found with either of them. With all the past villains in mind, consider that Mr. Freeze here carried over aspects of his Batman: Animated Series self. Rather than being the foe with a cheap gimmick he had originally emerged as, Freeze here was driven by a past loved one being on the brink of death and the anguish of that moment. It's often hard to remember that in the face of the multiple ice puns on offer, and Schwarzenegger was clearly hamming up the role even by his usual standards, but that's all people focus upon. Between those moments, there were a few genuinely quiet scenes which are often overshadowed by the bombardment of ham. Notably, Freeze is often seen lamenting over his lost wife and more than once he's shown being unable to associate with normal human beings. There's a literal isolation to his role, and a driven commitment to fix the one thing he has left. This, surprisingly, actually gives him a little more substance than what we saw with most villains up to that point. It's just a damn shame that this is forgotten thanks to, well, this. Even when it came down to the commentary upon the film, and you can find this in the behind the scenes moments, they don't focus upon the ham. The crew actually try to discuss how Freeze occupies a grey area in the Batman mythos and how the character himself was a shade different from their normal foes. Freeze is certainly no Loki, Ultron or Ra's Al Ghul, but beneath the cheesiness you could see the direction they wanted to go in. Given that Patrick Stuart was originally wanted for the role - and no, that's also not a joke - I personally have to wonder how much of his interpretation was mandated by the suits from Warner Bros. After all, following the tepid reception of Batman Returns followed by the safer and more marketable praise of Batman Forever, it wouldn't be surprising if they wanted to try and keep things on track with their prior outing. Sadly, going from what happened with Green Lantern, it looks like they've still not learned from that particular mistake. So those are two characters which can be argued as improvements over past outings, but what else is there on hand? Well, for starters, there's the visuals. Again, this seemed to be trying to follow Batman Forever's example as hard as it could, but really stop and compare the two when you have a moment. Both are cheesy, both are overly saturated and extremely neon and far too entrenched in the 90s version of the Silver Age, but there seemed to be more focus with Batman & Robin. 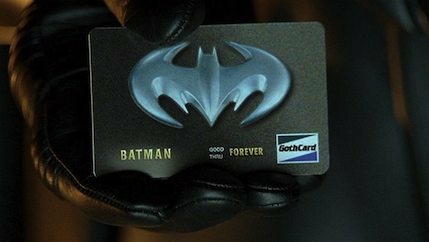 Whereas Forever seemed to be conflicted over Burton's established visuals with Schumacher's direction, the version of Gotham here is much more coherent. The environments are much more distinctly vibrant without relying nearly so heavily upon laser effects, and the neon glow tends to be a single consistent buzz rather than a cacophony against darker visuals. While still certainly not the Batman people wanted, it was at least a more refined version of the universe they were going for, cartoony effects and all. That and, let's be honest, at least this one could truly embrace what it was, whereas the films directly before and after seemed to be conflicted over what direction their visual aesthetic should take. So, is this article saying that Batman & Robin is a good film? Far from it. It's still the weakest in the franchise by a full mile, and even the praise on offer here can only be based upon intent, underlying themes or planning rather than true execution. Yet, that is what the Burton films are often praised for, and really, do those sound like the qualities of one of the single worst films in cinema? In an age where a big budget blockbuster delivers the line "I am directly below the enemy's scrotum", James Cameron insults his audience for being human and supporting technology, and Adam Sandler is churning out terrible films by the truckload, it's positively unremarkable. At the end of the day, it's bad but it's certainly not deserving of its reputation. At best, you can call it a victim of its era. So, what was the point in this article anyway? In all honesty, it was a chance for me to talk about the positives in something. In part due to planned works and in part thanks to reacting to current events, too many articles on here focus upon the negatives of certain works, even praised ones. Given what will follow in the next few days, it seemed like a nice opportunity to cover something positive for a change. Labels: 2015, adaptation, Batman, Batman & Robin, DC comics, film, science fiction, superhero, thought, Warner Bros. I've been a long-time lurker and have enjoyed your intelligent analysis of multiple topics and your frequent forays into the world of 40k (I'm a vet player.). Yet, for once, I'm not sure what you're saying. Specifically, this line: "James Cameron insults his audience for being human and supporting technology..."
Would you mind elaborating this small part of your article? Ah, my apologies, that was actually in reference to his work on Avatar. The film has some very disturbing misanthropic and Luddite undertones which just just makes me wince whenever people praise its works. I'm sorry for not being clearer on which film I was talking about. Anyway, thanks for commenting and reading my nonsense for so long.